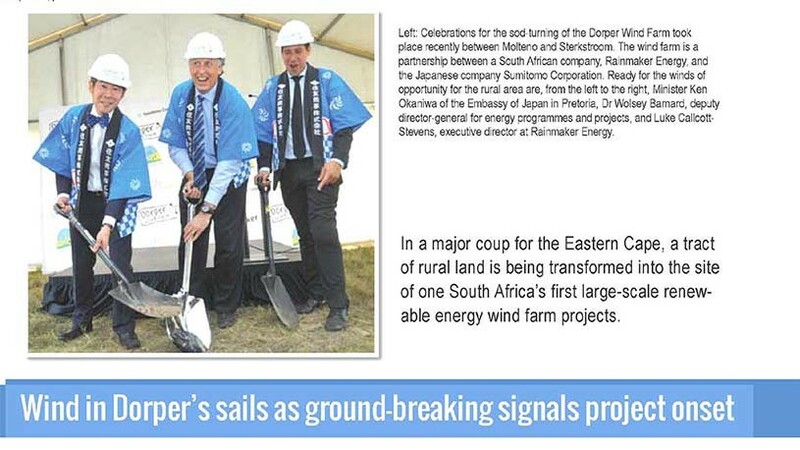 The first sod was turned today for the R2.2bn Dorper Wind Farm between Molteno and Sterkstroom in the Eastern Cape, South Africa. 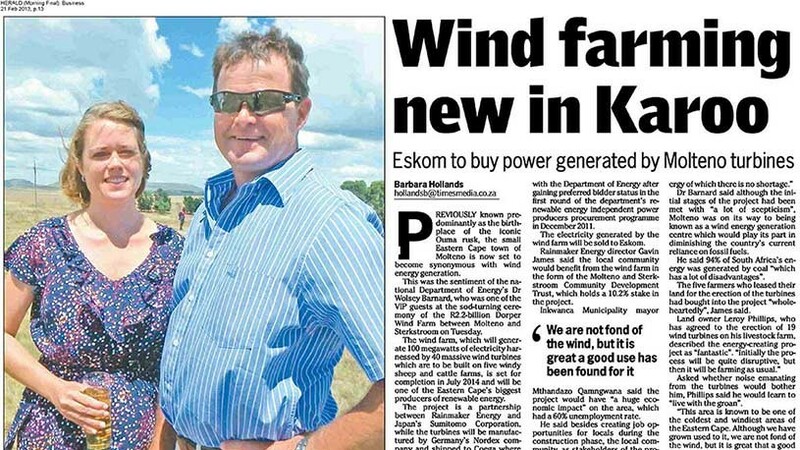 Livestock farmers are leasing grazing land for the erection of wind turbines in Eastern Cape. Eskom have agreed a 20 year power purchase agreement with the Department of Energy after winning the preferred bidder status in the first round of the renewable energy independent power producers procurement programme. 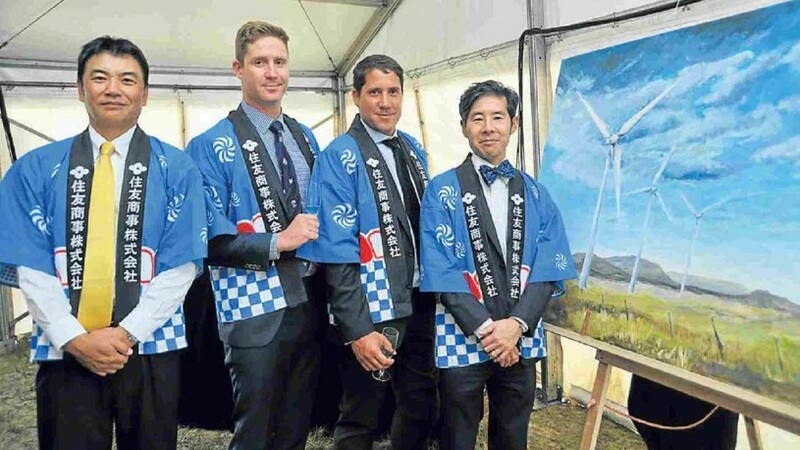 A Sumitomo Corporation-led consortium reached financial close on its 100MW Dorper Wind project on 16 November 2012. A Sumitomo Corporation-led consortium reached financial close on its 100MW Dorper Wind project on 16 November 2012. Dorper was one of the first deals in the initial round of the South African renewables programme to close, and was also one of the biggest in terms of power generating capacity. What made it really stand out from other wind projects in the programme, however, was its use of an ECA component. 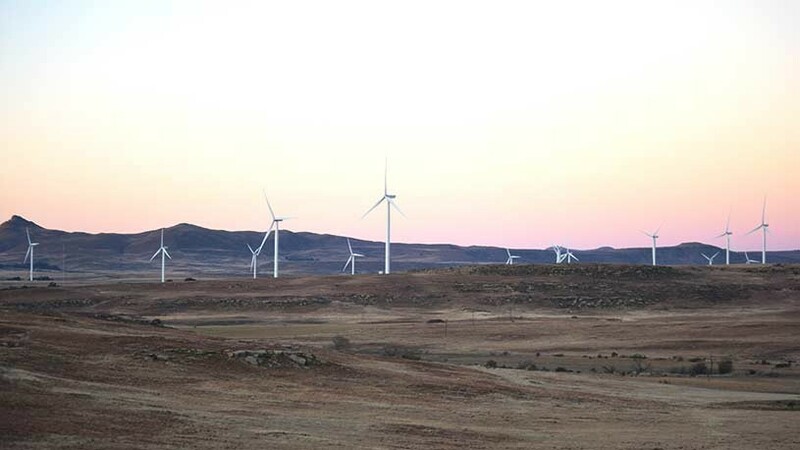 The South African Department of Energy (DoE) and state utility Eskom successfully closed the first 28 projects in their renewables programme during the final quarter of 2012. The first round represented R50 billion ($6 billion) in total investment, split between eight wind, two concentrating solar and 18 solar photovoltaic developments. The projects had a number of different domestic and international-based developers, though each project had to be at least 40% South African-owned, have a minimum of 12% black ownership and have 2.5% of its equity in the hands of local community groups located within a 50km radius of the development. 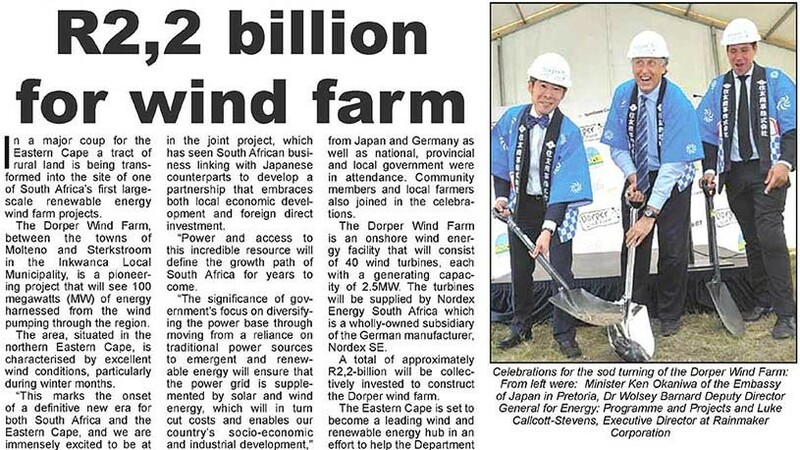 Summit Wind Power South Africa, a wholly-owned subsidiary of Sumitomo Corporation, is the main sponsor of Dorper, owning 60% of its equity, while local developer Rainmaker Energy, through its special purpose vehicle Dorper Wind Development, holds a 25% share. The remaining equity is in the hands of a combination of broad and narrow-based black investors. The Industrial Development Corporation provided the equity on behalf of the local community groups, while a trust established by Sumitomo and Rainmaker – the Molteno & Sterkstroom Community Development Trust – provided a subsidy to the black empowerment groups. Dorper easily satisfied minimum local ownership requirements, with about 25% black ownership and 10.2% of equity held by the local community. The South Africa renewables programme is unprecedented in Africa for its scope and ambition, with the government planning on tendering 4,360MW of capacity to developers in a series of rounds of bidding. South Africa has suffered significant energy shortages, and the renewables programme is one way of reducing that deficit. The first round of deals alone covered 1,416MW and all 28 projects moved forward simultaneously, creating significant logistical challenges. Financial close was originally scheduled for June 2012, but the level of due diligence required by the government kept on rising, pushing the deadline back on several occasions. Sumitomo joined the project in July 2011 and its involvement brought SMBC into the deal as the main co-ordinating bank. In contrast to most of the other projects in the first round, Dorper did not have to rely solely on local lenders, despite the requirement of the programme that debt be denominated in Rand. The banks lent a total of R1.617 billion ($175 million) in the deal, with the debt/equity split roughly 70/30. ABSA and Nedbank provided a combined total of R1.499 billion, split between covered and uncovered tranches, each with a 17-year tenor. SMBC lent R118 million on the larger coveredtranche, with ABSA and Nedbank lending an additional R608.5 million each. The two local lenders then provided a smaller R282 million tranche, with the debt split equally between them. German wind turbine manufacturer Nordex is the engineering, procurement and construction and operations and maintenance contractor for the project, and its involvement led to Euler Hermes offering a guarantee on the larger tranche. Dorper represents one of Nordex’s biggest ever single orders, and South Africa is a brand new market for the manufacturer. The sponsors mitigated this risk by getting Hermes to cover 80% of the larger tranche. Dorper is the first stage of the larger Stormberg wind facility. Rainmaker has received planning authorisation to install 244 wind turbines on land around the Dorper development. After the success of the initial project, Rainmaker plans to enter either one or two bids in the third window of the renewables programme in May. The Stormberg site has a possible total production capacity of 500MW. Sumitomo has yet to commit to sponsoring any further developments at the Stormberg site, but Rainmaker is confident it can attract other foreign equity investors, following the success of the Dorper deal. Only a handful of other non-South African sponsors, including Gestamp, Globeleq and Solar Reserve, participated in round one of the programme, making Dorper all the more exceptional. Development of a 100MW wind farm in the Stromberg District, as part of the South Africa renewables programme.